Reporting improvements you can use today; and AI’s role in the future. 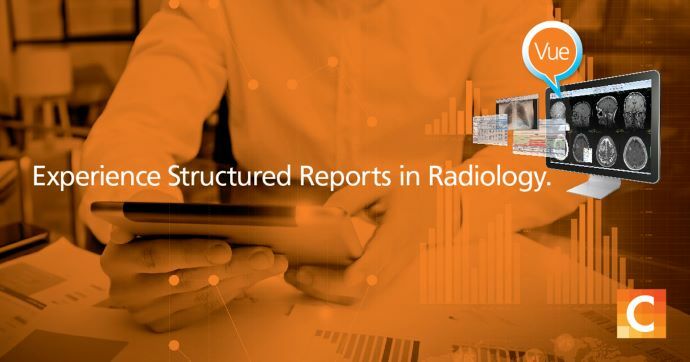 Interactive, multi-media reporting is readily available within radiology workstations today – yet the majority of diagnostic imaging reports in the UK remain text based. In fact, the format of medical imaging reports created by most radiology departments has not changed much in over 100 years. Interactive, multi-media reporting is readily available today – yet the majority of diagnostic imaging reports in the UK remain text based. But this status quo is about to change. In the short and long term, reporting will undergo a considerable transformation. Multi- media reports, hyperlinks, key images, and other productivity-enhancing features are available today in Carestream’s Vue Reporting module. The reporting module provides comparative data that is interactive and has rich multimedia content providing access to the report and associated key images. For locations that do not have access to an enterprise viewer (e.g. a GP surgery), we provide an encapsulated PDF with this content, with interactive links to a patient portal. The interactive report can help facilitate communication between stakeholders, enabling clinicians to collaborate interactively with reporters. In the future, the module will be able to support Knowledge Base. Based on the content in the report, it could include links to the related online reference materials. Today, Carestream’s reporting module has most of the advanced visualization tools required by reporters native within our application. This means you have one workstation that does it all: fusion, vessel analysis, coronary analysis, cardiac analysis, calcium scoring, PETCT – all within the Carestream application. For any bespoke or highly specialised requirements, we integrate to third-party applications via a context sensitive ‘Action’ button. We also provide central Vendor Neutral Index registry or, as we often refer to it, the Global Worklist. This enables cross-site viewing and reporting of images. This enables multiple hospitals to collaborate seamlessly with instant access to current and prior imaging, and the ability to enable cross-site reporting. In addition, of course, we have business analytics that provide dashboards and metrics of all transactions in the radiology IT actors. We all know about the demands on radiology being outstripped by the ability to supply, so there is a need to have high volume and productivity. At the same time, there is a growing need for reporters to participate in the care team through being available to discuss cases, participating in MDT meetings, interventional radiology, etc. Let’s take a closer look at Workflow Orchestrator. 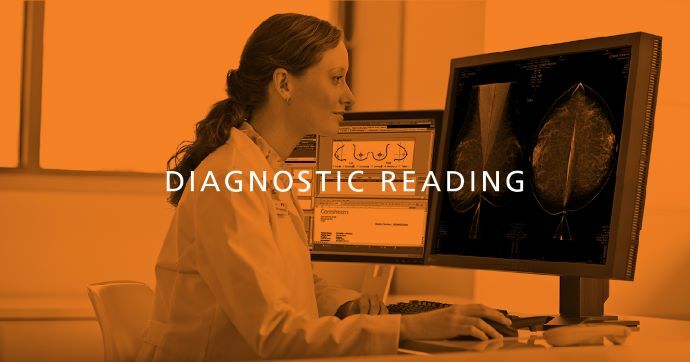 It is a dynamic worklist that automatically assigns studies to the most appropriate available radiologist while efficiently balancing caseloads to accelerate reading times. A reporter can log on to their enterprise imaging platform and the system will know what sessions (shifts) he or she works, their specialty, and any affiliations they have to referrers or institutions. The Orchestrator then customises the worklist dynamically for that reporter. The highest priority studies to be read – based on the service level agreement (SLA) for that image – will appear at the top of the reporter’s list. The lowest priority studies will be at the bottom. The time to breach also will be shown on the individual worklist as well as the site name. Prioritization: Cases that are urgent or approaching their SLA deadline have priority. Expertise: Cases requiring subspecialty expertise are selectively assigned to an appropriately trained radiologist. 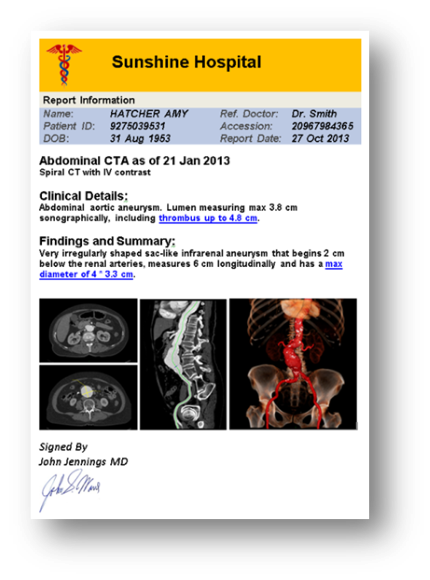 As you can see, there are many features available today that can move radiology reporting to interactive, multi-media reporting – and help make reporters more productive. So why are so many radiology departments still producing text-based reports? There are several reasons. Some practices have not had the time to configure or upgrade their existing software. Others are wary of reporting within their PACS, and are unwilling or nervous about making the transition. And others are not aware that these features are available today. You’ve likely heard a lot about artificial intelligence (AI) in radiology. AI will certainly influence reporting in the future. Here are some likely uses. Reports will be pre-checked for obvious errors and discrepancies. Potential errors and discrepancies will be highlighted in real time to the reporter. Reports will be easily searchable using a Google-type search and will be easy to data mine for clinical research and business data. By incorporating AI into the workflow, we will be able to further refine and prioritise reporting. For example, when patients’ images arrive in the archive, the image analytics algorithm will automatically work in the background. Carestream calls this the “Radiology Assistant”. Here is how it works: a widget appears on the reporter’s screen and has a traffic light system against each of the algorithms. Where it is green, it is within tolerance. Where it is red, the algorithm has detected some abnormal findings. By selecting the widget, the findings are displayed and the reporter has the option to add the findings to the report. If we combine the image analytics provided by AI with the Workflow Orchestrator we can prioritise the worklist further. For example, if the image analytics detected a brain bleed in an image from the emergency department (ED), the Workflow Orchestrator will automatically (based on site specific customization and prioritization) place this patient’s images at the top of the ED reporting list. It will annotate the study with an icon showing that a brain bleed has been found by the AI, and will assign an appropriate SLA to the image to ensure it is read urgently. Another change on the horizon, which will assist in fueling further AI developments, is that reporting software will likely use more standardised language. Ultimately, I believe that AI will “sift out the abnormal,” enabling reporters to focus on cases that require the most attention. We know that machines will eventually win the speed war. They don’t get tired and they can work 24 hours a day, seven days a week. However, if we harness AI correctly, there is the ability for reporters to win as full-service physicians, and participate more fully in the care team. Another future development is replacing the word “PACS” with “Imaging Health Record”. This is much more than just a change of terms. An Imaging Health Record approach is critical. We call ours the Clinical Collaboration Platform. It underpins radiology, pathology, dermatology, ophthalmology, medical illustration, endoscopy, cardiology and any other ’ology you care to mention. It is VNA with workflow and intelligence. It provides the structure, context, and secure storage and management for images and information currently stored in many unsecure silos around hospital facilities. Also, the benefits of artificial intelligence and imaging analytics software tools are stronger when incorporated into an Imaging Health Record. Whether you call it a PACS or an Imaging Health Record, the future is exciting and we are only at the beginning. The CEO of SoR explains why radiologists are sharing more reporting responsibilities with radiographers in the UK. Read how Reggio Emilia implemented an integrated solution for archiving DICOM and non-DICOM media from 28 departments. Carestream’s VNA and Universal Viewer earned top KLAS ratings from healthcare providers. Read the news release to learn why. 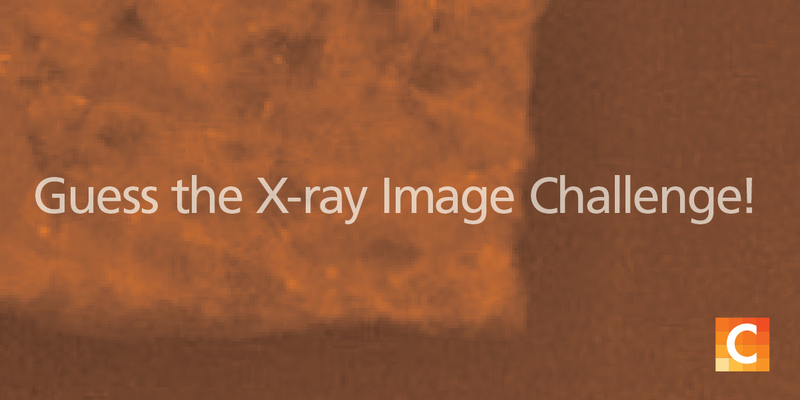 Learn how analytics and productivity solutions can increase the value of your enterprise imaging platform. Thank you for your nice comment and for reading Everything Rad.